The Fourth of July is Independence Day in America, the day when the country commemorates the 1776 Declaration of Independence from Great Britain. Here are ten facts about this fun-filled day of fireworks and flagwaving. Is 4th July 1776 the date that the United States of America became independent from Great Britain? Possibly not! Congress actually approved the resolution to become independent on 2nd July 1776, so 2nd July should be Independence Day. Even future president John Adams predicted that generations to come would remember 2nd July as been the most important date in America's history. The reason Independence Day is celebrated on 4th July is because it was on 4th July 1776 that the wording for the Declaration of Independence was finally agreed. This is the date that appears on the Declaration. Not only that, the Declaration wasn't even signed on 4th July. It was signed on 2nd August 1776! The Declaration of Independence was signed by 56 people, representatives of the thirteen former British colonies that would become the first thirteen states of America. Those states were Connecticut, Delaware, Georgia, Maryland, Massachusetts, New Hampshire, New Jersey, New York, North Carolina, Pennsylvania, Rhode Island, South Carolina and Virginia. Of the people that signed the Declaration of Independence, two went on to become Presidents of the United States of America. They were John Adams, the second President, and Thomas Jefferson, the third President. In a bizarre coincidence, both men died on the same day in 1826! Even more bizarre, the date that they died on was 4th July - Independence Day. Not wanting to be left out, James Monroe, the fifth President of the United States, and the final "Founding Father" to be a president, also died on an Independence Day. This was on 4th July 1831. It took almost one hundred years after the Declaration of Independence for 4th July to become an official holiday. Congress declared the date to be a holiday from 1870. Woohoo! Go Congress! As Independence Day is a national holiday, if 4th July happens to fall on a Saturday, Friday 3rd becomes a holiday. This will next happen in 2020 as 4th July falls on a Saturday in that year. If 4th July falls on a Sunday, Monday 5th becomes a holiday. The 1996 movie, Independence Day, tells the story of an alien attack on Earth. The aliens arrive at Earth on 2nd July, the same day as the film was released in the US. They unleash attacks on the planet but are no match for Will Smith and Randy Quaid who, on 4th July, destroy the main alien spaceship from within. Yay! A sequel was released in 2016. 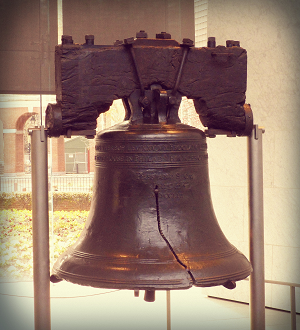 The Liberty Bell, once situated in Independence Hall in Philadelphia and now on display in the Liberty Bell Center in Philadelphia, is often seen as a symbol of America's indepedence. It is sometimes said to have received its famous crack after having been rung on 4th July 1776. The bell wasn't rung on that day, although it is likely to have been rung on 8th July 1776, and on subsequent Fourth of Julys. It didn't crack until sometime in the early 1800s. Former Manchester United, England and LA Galaxy footballer David Beckham married Spice Girl, Victoria Adams (Posh Spice), on 4th July 1999 in Dublin, Ireland. It is well known that Americans love their flag, and no more so than on Independence Day. They also like to set off one or two fireworks to celebrate the occasion. The nation imports about $3.5 million worth of flags and $220 million worth of fireworks each year - from China!